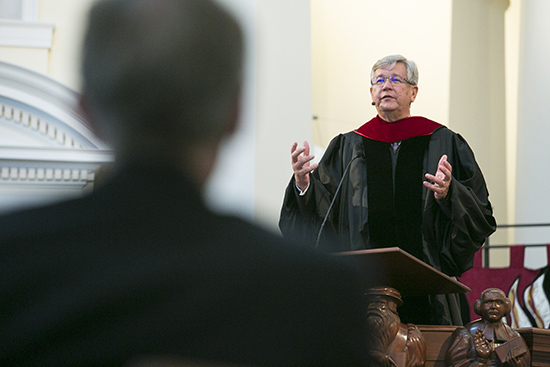 Why would Jesus say that the persecuted are blessed?” asked Randel Everett, president and founder of the 21st Century Wilberforce Initiative, in the opening convocation of Samford University’s Beeson Divinity School Aug. 18. The reason is because of their godliness and their sincere desire to follow Christ, said Everett. “The world of darkness wants to extinguish those who bring light,” he said, preaching from Matthew 5:1-12. Everett founded the Wilberforce Initiative, a Christian non-profit that seeks to advocate for human rights and religious freedom, almost a year ago. He interlaced stories with statistics throughout his sermon. He told of an 18-year-old girl in Nigeria who was asked to recant her faith in Christ. When she refused, they buried her in the ground up to her neck. Her persecutors asked her one more time to recant. After she refused a second time, they stoned her to death. Religious persecution is relevant today because it is happening all around the world, he said. According to Everett, 77 percent of the world (5.3 billion people) live under religious persecution or oppression. This statistic includes people of all faiths. In the Asia Pacific alone, 85 percent of the people live under religious persecution or oppression. Twenty Christians on average die daily for their faith around the world, which equals to 300,000 deaths over the past 10 years due to religious persecution. In Iraq in 2003 there were 1.5 million Christians. Today there are less than 300,000. “The Church has got to speak up for those who are voiceless,” he added. “We do this because we are following in the steps of our Savior,” he added. The convocation, presided over by Beeson Dean Timothy George, also included a time of prayer and commitment for Beeson’s new associate dean, Grant D. Taylor, and his wife, Rebecca. Samford President Andrew Westmoreland led in the reading of Scripture. The theme for the fall semester chapel services is Finkenwalde in the School of Bonhoeffer. Services take place every Tuesday at 11 a.m. in Hodges Chapel. To learn more about the Wilberforce Initiative, visit www.21wilberforce.org.